AT only 15, one shooter at the National Trap Championships in Roma has been doing more than breaking targets - he has been smashing expectations. 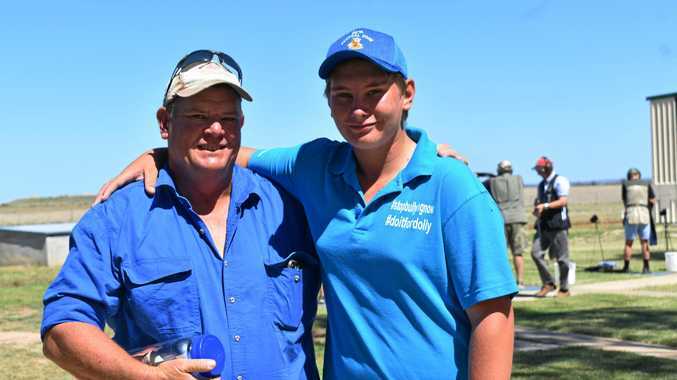 As well as making top shots at the tournament, which winds up on Sunday, Callide Dawson Gun Club member Travis Streeter has spent his week selling tickets for a charity shoot, raising money for Dolly's Dream. "Do it for Dolly tickets are about helping raise awareness for suicide prevention with young people,” he said. "As of Thursday morning, we had sold 655 tickets. "Seeing as nationals are such a big event and Dolly was close to many of us in the shooting fraternity, we were hoping to at least sell 500. Travis' dad, Shane, said he was impressed by his son's charitable efforts. "Travis came up with the idea that he would like to raise money for Dolly's Dream foundation,” Shane said. With help from Shane, Travis has expanded the fundraiser, which will give two lucky ticket-holders the chance to shoot for prize money. "He wants to sell these tickets, and most of the proceeds will go to the fund, and one shooter will be drawn to shoot for a $1500 prize,” Shane said.